Six old ladies were in the habit of visiting a certain tea house once a week—all interesting women, and one of the number was soon to celebrate her ninety-fourth birthday. She confided to the proprietress that she wanted to give a party, and it was to be as jolly as she could make it. There were to be no peppermints and no weak tea. She had had peppermints given to her every birthday since she was seventy. The party was a luncheon carried out in yellow and white. The daisies in the centerpiece were made into six bunches, one for each of the party. The favor at each place was a Dresden pincushion, and the place cards were symbolic of the Fountain of Youth. 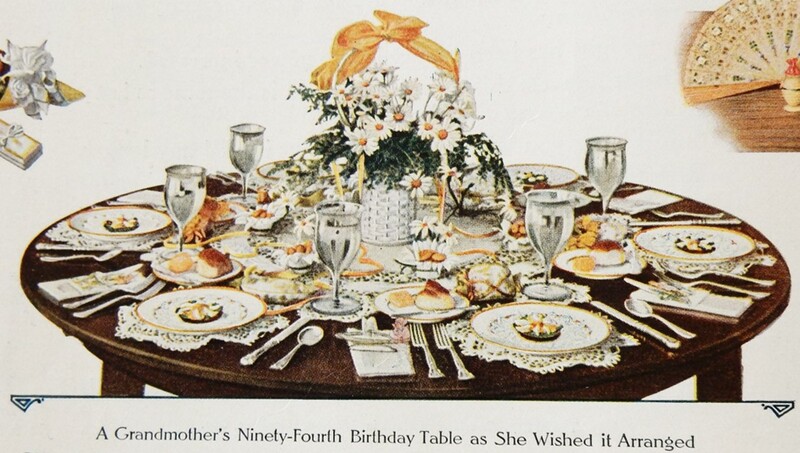 I know that the drawing and text do not refer to a real woman, but the fact that this picture was in a mass-circulation magazine suggests that lots of hale and hearty women in their eighties and nineties were reading the magazine a hundred years ago — and thinking about how to celebrate their birthdays. Posted on September 24, 2015 September 23, 2015 by SherylPosted in HolidaysTagged birthday, table setting. What a sweet table arrangement. I’d just love to have one of those pincushions! I googled Dresden pincushions, and was surprised to discover several websites with directions for making them. Peppermint candy every birthday until 70. What a hoot!! I wouldn’t want anymore of them either!!! Although I like a candy cane stuck in a cup of hot mint tea. Lovely table sitting. mmm. . . a candy cane in mint tea sounds good. I would love to have a birthday party like this, especially if I make it to 94. So would I. It sounds like it would be a wonderful party. They are lovely. I have some doilies that my mother crocheted which look similar to these placemats. The idea of the table setting is delightful, but so crowded! And so much stuff! I think I’d be claustrophobic. Pictures of tables a hundred years ago often show huge centerpieces. That apparently was the style at the time–though it seem like it would be difficult to see (or talk to) people on the other side of the table. That sounds like a lovely party! I love the idea of each guest receiving flowers. She was 94! Wow! And still having fun! The flowers are a nice touch. And, I also love the idea that she was still having fun with her friends at 94. Delightful indeed! And daisies….my favorite! I agree. . . it’s delightful. I know that I had some ancestors in the early 1900’s who lived up into their 90s–but I’m not sure how common it was. This cracked me up: “There were to be no peppermints and no weak tea. She had had peppermints given to her every birthday since she was seventy.” When you think of it, that’s 24 years of peppermints. It certainly was time to change things up! On her 90th birthday, my mother wanted a bottle of Kahlua. We obliged. I’m glad you liked it. I agree that after 24 years, it was time for something different. . . Your mother sounds like she was a fun person. I guess if she was turning 94 she had all the right to request whatever she did/didn’t want. I agree- I guess that’s one of the advantages to growing older. I never thought about that with the peppermint. Your grandmother sounds like she knew how to enjoy the little things. It sometimes seems like people paid more attention to the design of the table for any gathering a hundred years ago. There were centerpieces, party favors, place cards, etc.